March 15, 2018 (Greenwich, CT) – The Greenwich Association of REALTORS® announces the statistics for home sales in The Town of Greenwich, CT for the month of February 2018. 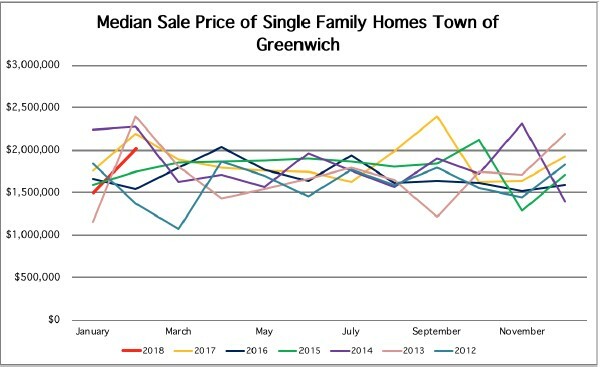 There were 36 single-family residential closings reported during this period according to figures provided by The Greenwich Multiple Listing Service, Inc., the multiple listing service used by REALTORS® in the Greenwich area. The number of single-family residential closings increased, compared to February 2017 when there were 31 closings in February. The median sale price for a single-family home decreased to $2,025,000 from $2,200,000 the median sales price in February 2017. The average days on the market (DOM) for residential homes was 271 days; which was an increase from 224 days in February 2017.
strong spring market and are hopeful our numbers will continue to increase as the spring season approaches,” stated BK Bates, 2018 President of the Greenwich Association of REALTORS®.